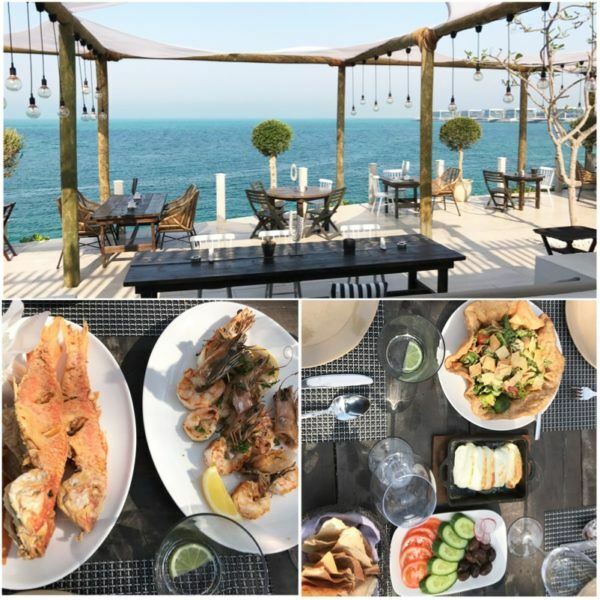 On a recent trip to Abu Dhabi, which seems to be ‘my’ Emirate of choice – as we have visited 3 times in as many years (you can read about our very first trip here) – we did not go to the desert. We went for a day trip to somewhere quite special: a private island located off the mainland and we liked it so much, we went not once, but twice during our recent Easter break there, which also coincided with my birthday. 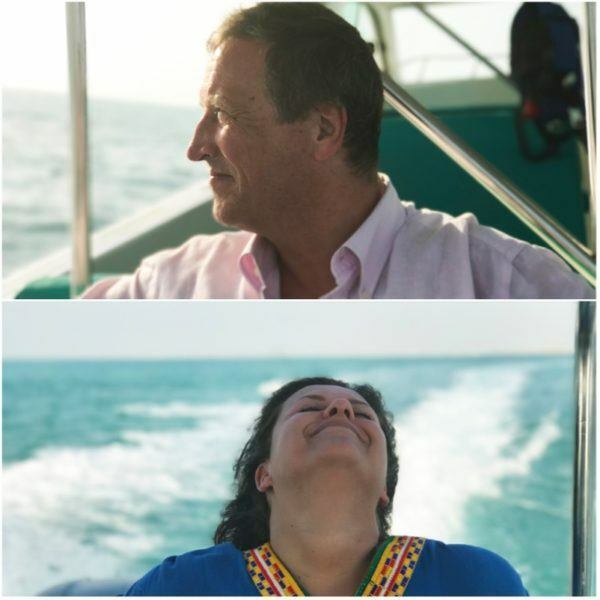 I had first read about Zaya Nurai private island on Catherine’s blog a while ago and I had made a mental note to visit on a subsequent trip. And interestingly, you don’t actually have to stay at the hotel provided you are organised and book a day pass. I thought it was interesting because a) I did not want to change hotels during our stay, b) the idea of going to a completely different place with only a 10-minute transfer seemed pretty good and risk free and c) because if we did not like it, we would only waste a day from our trip. But we did like it… a lot! Well, you can book directly with the hotel – by calling or emailing, but in my experience, they did not actually answer the phone very often (which I found pretty strange). I had 2 friends go there also for the day in the past month and one was able to book that way, the other wasn’t. But worry not, I have another option. 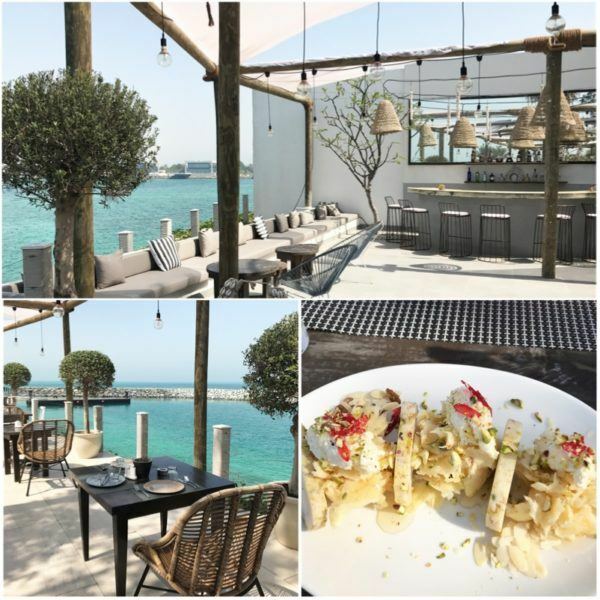 I found this concierge company in Dubai and they are the only external party to sell the day passes, also for the cost of AED420, which is approximately £90/$115. I booked, paid and had everything sorted within a few hours, so I have no problem recommending them. You will basically be a guest of the ‘Food & Beverage’ department and you will have a resort credit to spend during your day. You can stay as late as you want (the last boat departs at 11pm) and you will either pay everything in full at the end of the day if you have booked directly, or just the difference if you have booked through the concierge company. I had both experiences as we decided to return on our last day and this time, I simply told the F&B person to book us in and it was no problem. 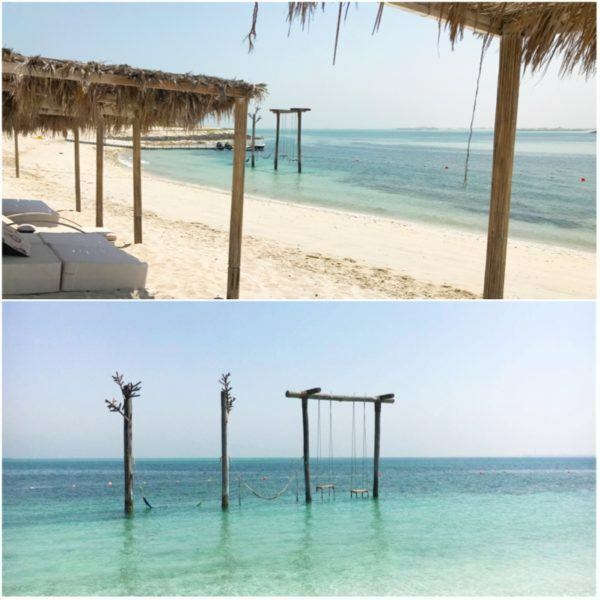 Zara Nurai is an island located 10 minutes by boat from Saadiyat Island, our little playground in Abu Dhabi. I am quite fond of this area as the local authorities have prioritised low rise buildings and the beaches are pretty perfect. Your journey starts at the Zara Nurai Welcome Center, which you can get to by car or taxi (and is 15 minutes away from Abu Dhabi city centre). Here, boats depart every hour (at half past the hour) to the island. I would recommend the 10.30am boat as you will be pretty much the first guest to get there and will have a pretty good choice of sun loungers. This is important because there aren’t that many – day passes really are limited and most hotel guests do stay in their own private beach/pools. The journey is very short and on arrival, one can feel a bit lost – depending if there is a host there waiting for the boat, or not. The reception building was the strangest I have ever seen – there is no ‘grand entrance’. You literally have to find your way around a building through a side path (seriously…) only to be told that your check in is at the pool next door. We found a lovely lady who explained to us how everything worked – which was basically to make sure they added everything to the same bill and it would get transferred to the next venue. All in all, there is room for improvement here. There are 2 pool areas that day guests can choose from – the one with the larger pool, 1 minute walk from the reception building, located to the right, and the ‘Smoking Pineapple’ which is accessible via buggy and located on the other side of the island. We thought the first pool was more family orientated (which is not always the case), so we chose to go to the other one. Because I wanted to see the swings. It is all about the swings. And in my book, this looked pretty good. 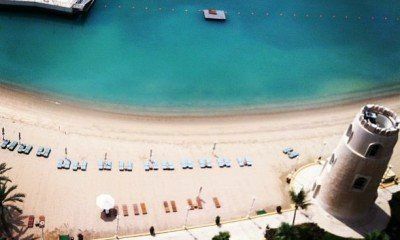 We first went on a Saturday (which is the Sunday equivalent in the UAE as the weekend starts on Friday), and it was quite busy (within reason as we had no problem getting a sun lounger, of which there could be a few more anyway), but it was all ours on a Tuesday. The beach was lovely and as the photos show, there is a bar which has a pool and, if you must know, probably the nicest pina coladas I have had in a long time. But no photos because some things should remain a mystery. But trust me on that one. Needless to say, there are plenty of towels and facilities. The island has various restaurants, but we wanted to try the fish one, which is called Hooked. And I have to tell you – it was not only gorgeous… it was delicious. You can pick your fresh fish and let them know how you’d like it cooked. We loved the Lebanese-inspired menu (something tells me that Lebanon will come up in my horizon at some point) and we couldn’t fault the service either. Lunch for 2 (and the other 4 pina coladas) was 1034 AED – around £210 / $250. It was exceptional and worth every penny. If you do the math, you will see that we exceeded our AED 840 allowance (based on 2), so we just paid for the difference at the end of our stay. We had red mulet (my favourite fish) on both occasions, salad, halloumi and the most delicious prawns. And shared some rose wine, of course. Also, do try the ‘arabic’ ice cream – it really is exceptional. To finish the day ‘really well’ – I made a spa appointment (a 50 minute massage was around £130 inc tax) and I can also recommend the experience. 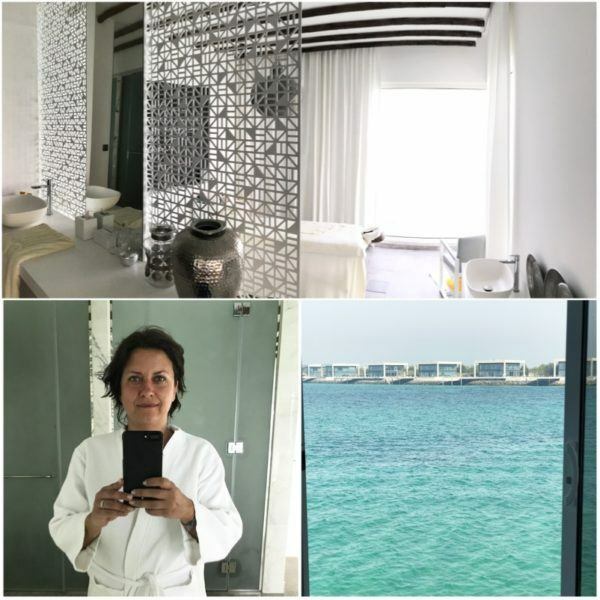 The treatment rooms were beautiful – and I did notice the Acqua di Parma full sized toiletries as I had a shower before to get rid of the salt water and sand. On our second visit, we had a shower there and changed to civilian clothes – so it worked really well for us as we left our hotel in the morning, spent the whole day at Zaya Nurai, and then went out for some shopping and dinner, before heading to the airport for our 1.50am flight back to London. The change in scenery was really quite dramatic – and this must have been one of my favourite ‘day trips’ in a long time. 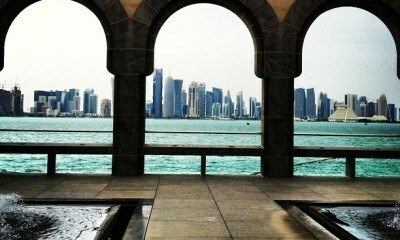 If you are in Dubai, remember that Abu Dhabi is only an hour drive away. 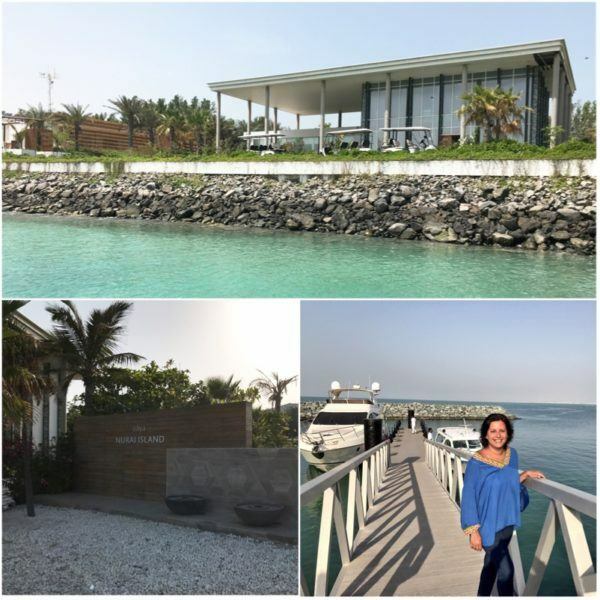 And if you are staying in Abu Dhabi (which I highly recommend), it will take you 15 minutes from any hotel to get the boat. PS. Have you actually stayed here? How was your experience? I read very mixed reviews so I still have not decided if I would stay on a subsequent trip or not and would value your advice. Day Pass to Zaya Nurai – 420 AED (aprox £90 / $115). Book directly with hotel or concierge company – but also worth seeing if your hotel concierge can just sort it. I’m so glad I came across your blog as I’m planning on visiting Zaya Nurai Island later this year. 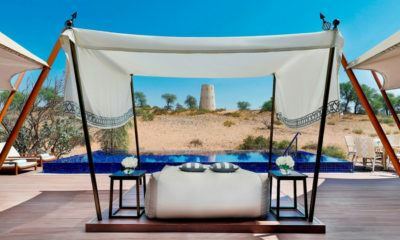 I wanted to know if you visited Saadiyat Beach Club and spent some time there? I’ve heard both are just as beautiful and curious to know if they require a day each or if they can be combined in one day. So pleased to hear! And I would like evidence of the swing, please! Thank you so much for this! I have been drooling over this island for so long but couldn’t afford to actually book a night. The link for the concierge for a day pass saved me. You’re amazing! So glad you loved it as much as I did, and thank you for the mention! That’s so weird no one greeted you when you arrived – we had a lovely lady to took us around and showed us where everything was. 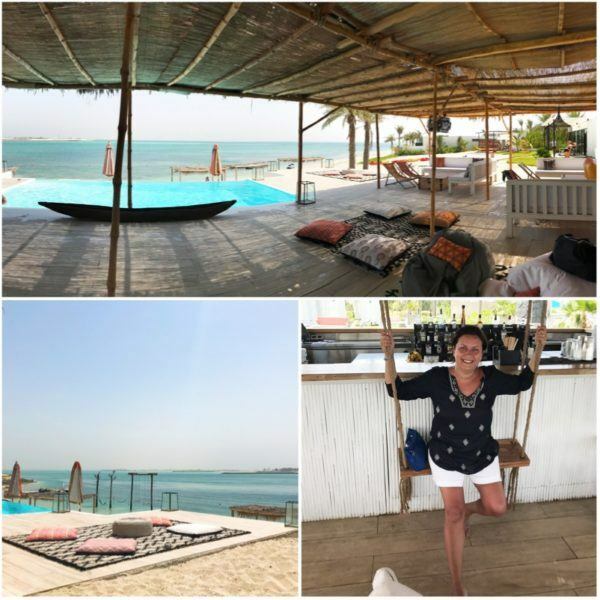 And OMG that pool by the ocean swings looks amazing – it wasn’t there when we went last October! Catherine recently posted..Belmond La Résidence d’Angkor, Siem Reap.